Wide open spaces and unforgettable views amid privacy and convenience. A private, gated community welcomes you to a privileged and intimate lifestyle, a secluded environment in which to live and entertain guests. Abundant beauty awaits you in this tranquil desert enclave consisting of twelve estate size home sites, allowing endless possibilities for the custom home of your desires. 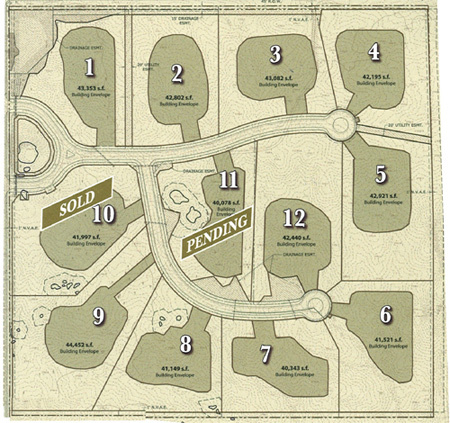 Serenity is just one of the elements you’d expect from an affluent development. 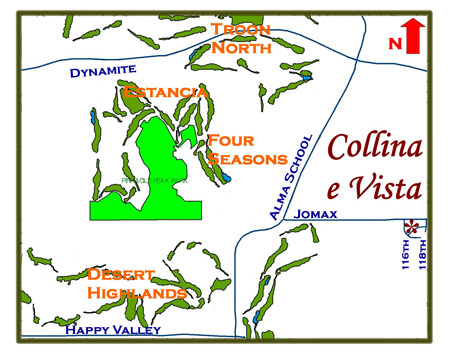 The location of Collina e Vista is exceptional. Perched at the pinnacle of Scottsdale the home sites have unrivaled territorial views. Collina e Vista is a peaceful retreat to come home to. Allow yourself to be embraced by this extraordinary setting, framed by desert charm with unparalleled views of the mountains near and far. The vista is uninterrupted for miles, a sweeping panorama of nature’s bliss. A long held vision becomes a reality for those fortunate enough to live in this superb and prestigious address. Collina e Vista epitomizes the essence of Scottsdale’s best. The community is located just north-east of Scottsdale’s famed Troon mountain, where the pristine beauty of the Sonoran desert is evident with endless mountain vistas and spectacular sunsets. All this within forty acres of gently rolling terrain, rich in character, that still offers convenient access to the active urban life style. Experience carefree living in an open, elegant and serene environment where the beauty of the land combined with exquisite European architecture results in an excitingly warm retreat and the sophisticated urban life becomes a reality.